FORT LAUDERDALE - Hopes were high among organizers and exhibitors, and lines were long with show-goers this morning, as the 51st Fort Lauderdale International Boat Show opened under sunny skies and with the promise of a good event for an industry in need of a boost. 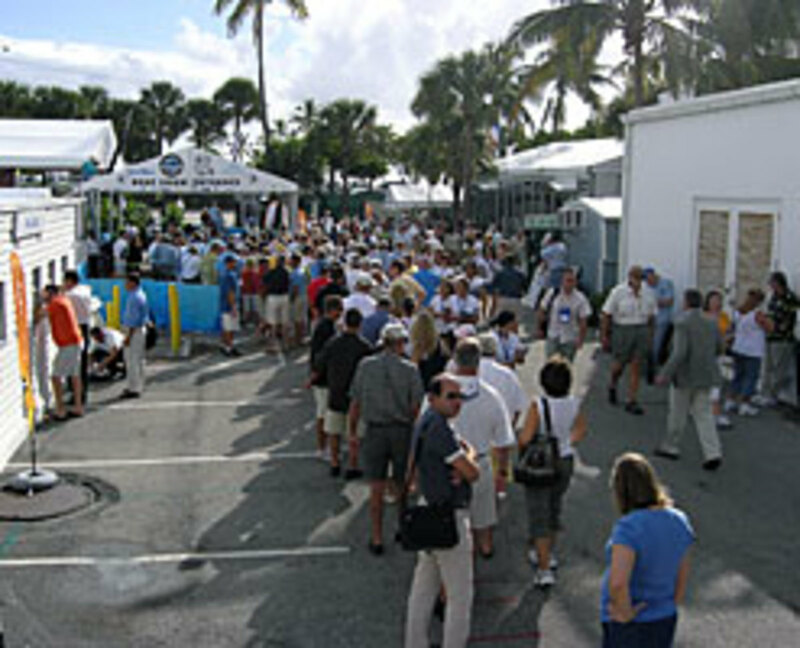 Although organizers had budgeted this year&apos;s show down 10 percent from 2009 in terms of attendees and exhibitors, revenues are up 5 percent, Efrem "Skip" Zimbalist III, CEO of FLIBS organizer Show Management, told the media at a press breakfast prior to the opening. Also, he said, preregistered attendance is up double digits over last year. "All things are boding well for a strong show," he said. "We do sense that consumers are coming out. I think we are going to see attendance up this year." There are 1,087 exhibitors this year, including many who were not at last year&apos;s show and some who increased the number of boats they are displaying. The show encompasses more than 3 million square feet of exhibit space and features more than $3 billion worth of boats, engines, accessories and more. "The thing that makes Fort Lauderdale Fort Lauderdale is the support that it gets from the manufacturers and the fact that the whole industry is here," Zimbalist previously told Soundings Trade Only. "So it becomes, in addition to a boat-selling show, a boat networking show, a [business-to-business] show where you can come and the suppliers to the industry come and meet their customers." Panelists this morning discussed the future of the industry, as well as the importance of keeping people in boating. Zimbalist noted that the average price of a cruiser has gone up 225 percent in the last 10 years, while sales volume is down about 70 percent in that time. Perhaps the industry has gotten "carried away with the bells and whistles," he said, adding that work needs to be done to keep costs down. As a boat show organizer, Zimbalist said he&apos;s doing his part to keep the costs of exhibiting "from getting too outrageous." To better meet the needs of consumers, there are more educational seminars this year and there has been more outreach through social media, as well as traditional means of communications. "The state of the show is strong," he said. Marcel Onkenhout, CEO of Dutch megayacht builder Oceanco, noted that while his company had no inquiries for new yachts in 2009, in 2010 "people have been making up for lost time." "People are taking longer to make decisions," said Onkenhout, whose company builds yachts from 280 feet and up. "We are anticipating the growth in demand in 2012." And though few governments support the megayacht industry, he said it can take more than 1,000 people three to four years to build one yacht. Yachts are more than just a hobby for rich people; they stimulate the economy, he said. Wayne Huizenga Jr., CEO of the Rybovich superyacht marina and refit facility in Palm Beach, agreed that boating is more than meets the eye. The industry represents $18 billion annually in Florida alone and accounts for about 180,000 jobs in the Sunshine State. "Yachting and boating is a very positive thing. This is not an evil thing. This is not a wealthy thing," he said. "It&apos;s a wonderful way to unite and bring the family together." Huizenga predicted that as the stock market recovers, the boating industry will see more positive growth. "We continue to be bullish on the industry," he said of his company. "It is a fantastic industry." The Fort Lauderdale International Boat Show runs through Monday.